An outspoken member of Congress says he is frustrated that the Marine Corps' top general has not yet addressed questions put to him nearly two months ago about the fallout from a whistleblower complaint. 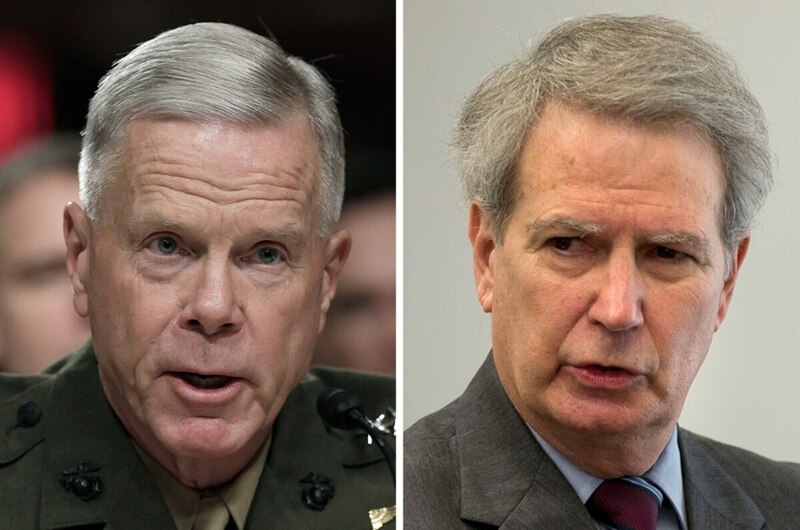 At a March 12 House Armed Services Committee hearing on the Navy Department's 2015 budget, Rep. Walter Jones, R-N.C., confronted Marine Corps Commandant Gen. Jim Amos about the treatment of Maj. James Weirick, the attorney who accused Amos and others close to him of abusing their authority, and about comments Amos made to NPR refuting the sworn testimony of another general whom Amos removed as the convening authority in a series of high-profile legal cases. Weirick, who was fired from his post in September and served with a restraining order after sending a testy email to one of Amos' advisers, has an active reprisal complaint filed with the Pentagon Inspector General. In the hearing, Jones asked Amos to respond in writing within six weeks. It appears that the delayed response may be due at least in part to a technicality, as the formal exchange of questions from Capitol Hill to the Pentagon did not occur until several days after the hearing. "That's no excuse," Jones, whose district in eastern North Carolina includes three Marine Corps installations, said May 1. "These are not difficult or technical questions: 'Were you a part of what happened?' They probably had an answer to that within three hours." A Marine spokesman at the Pentagon, Maj. John Caldwell, said "responding to Congress in a timely manner is a top priority." "However, we must ensure our responses are properly staffed and reviewed prior to submittal — this ensures our priorities and concerns are consistently and concisely represented," Caldwell said. "Our staffing process in this matter is near complete. Our responses will be delivered to the committee soon." A source in the building also said that while Amos' answers are forthcoming, they will be "limited" because the IG investigation is ongoing. Jones' aggressive support for the whistleblower Weirick has become a sore subject at Marine Corps headquarters. Before confronting Amos on Capitol Hill, Jones lobbied the IG's office and the Information Security Oversight Office, which is investigating Weirick's allegations that Amos and other senior Marine officials flouted procedures associated with the government's security classification system. As a result, Jones drew a rare rebuke from headquarters. Weirick and those close to him also continue to force the issue. His friend and fellow attorney Lee Thweatt has collected more than 2,000 signatures on a digital petition launched in late April urging House Armed Service Committee Chairman Rep. Buck McKeon, R-Calif., to lean on Amos. And weeks before, Weirick had sent lengthy emails to the commandant's top civilian and uniformed attorneys, Robert Hogue and Maj. Gen. Vaugh Ary, offering to "assist" Amos in answering Jones' questions. In his messages, Weirick enclosed results of two recent mental health exams — by a military doctor and a private specialist — concluding he is fit for full duty and poses no safety risk. It was Hogue who told Marine Corps Times that Weirick's firing and the restraining order were necessary in light of last year's mass shooting at the Washington Navy Yard. And that was the centerpiece of Jones' questioning. "Since you were named in the protective order," he said, "did you fear Major Weirick?" He also asked Amos whether his comments to NPR in February implied that Lt. Gen Thomas Waldhauser lied under oath about their exchange prior to his removal from those high-profile legal cases. Waldhauser said last year that Amos wanted Marines "crushed" and kicked out of the service for their role in an inappropriate YouTube video showing four scout snipers urinating on dead Taliban foot soldiers. Amos has denied saying that. Jones, who is in the midst of a re-election campaign, says he's determined to see Weirick's named cleared. "I'm going to be like a dog on a bone with this one," he said. With reporting by Hope Hodge Seck and Geoff Ingersoll.